Gamma-aminobutyric acid (GABA) was discovered in the brain in 1950 by Eugene Roberts. GABA is now considered one of the most important neurotransmitters and developmental signals. Knowledge on the complexity of GABA function is increasing exponentially. 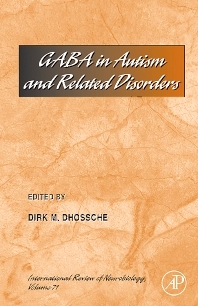 This volume covers basic research on GABA in the developing brain as it may relate to onset of autism and related developmental disorders. The evidence that dysfunction of GABA and related molecules is associated with autism is limited but expanding and seems to converge. Pertinent data are reviewed in this book and new research avenues in the basic and clinical arenas are described. The topics are of imminent interest to basic and clinical researchers as well as interested clinicians. Neurologists, neurosurgeons, neuroradiologists and other neuroscientists who are dedicated to the advancement of techniques used to evaluate the neurobiology of autism.